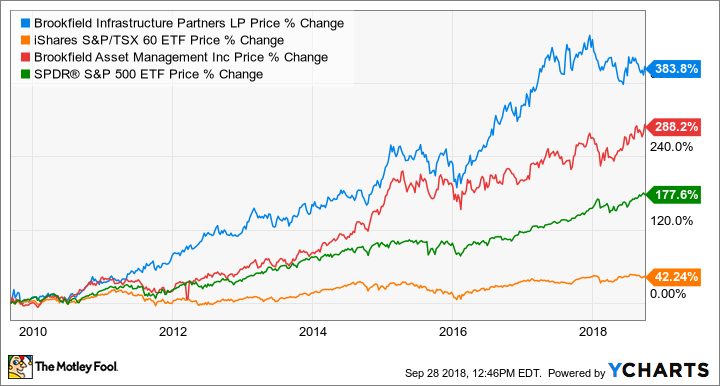 The Motley Fool Canada » Dividend Stocks » Is Brookfield Asset Management Inc. (TSX:BAM.A) or Brookfield Infrastructure Partners L.P. (TSX:BIP.UN) a Better Core Holding? Is Brookfield Asset Management Inc. (TSX:BAM.A) or Brookfield Infrastructure Partners L.P. (TSX:BIP.UN) a Better Core Holding? Brookfield Infrastructure Partners (TSX:BIP.UN)(NYSE:BIP) and Brookfield Asset Management (TSX:BAM.A)(NYSE:BAM) have both been excellent long-term investments that outperform the North American markets. Since inception in 2009, Brookfield Infrastructure stock has generated returns of about 21% per year on average. In the same period, Brookfield Asset Management, or BAM, stock has delivered annualized returns of about 16%. BIP.UN data by YCharts – Comparing 10-year price returns of BIP.UN, BAM.A, XIU, and SPY. Brookfield Infrastructure Partners (TSX:BIP.UN)(NYSE:BIP) and Brookfield Asset Management (TSX:BAM.A)(NYSE:BAM) have both been excellent long-term investments that outperform the North American markets. Since inception in 2009, Brookfield Infrastructure stock has generated returns of about 21% per year on average. In the same period, Brookfield Asset Management, or BAM, stock has delivered annualized returns of about 16%. Let’s compare the two companies. Brookfield Infrastructure owns and operates global infrastructure assets that are essential to the markets it serves. Its diversified portfolio is comprised of assets, including electricity and gas transmission and distribution, toll roads, railroads, ports, telecommunications towers, water infrastructure, etc., in utilities, transport, energy, or communications infrastructure sectors. Brookfield Infrastructure is already very diversified with 31 businesses across five geographies. But BAM is even more diversified. BAM owns a big piece of Brookfield Infrastructure — about 30% to be exact. On top of that, it also invests in public securities and has huge stakes in its other listed partnerships, including a quality real estate portfolio, a global renewable power platform, and a private equity arm. Both Brookfield Infrastructure and BAM offer U.S. dollar-denominated distributions, which boost their effective yield most of the time when the U.S. dollar is stronger than the Canadian dollar. Brookfield Infrastructure tends to offer a bigger cash distribution. It currently offers a yield of about 4.7%, and it aims to increase its cash distribution by 5-9% per year. As of writing, BAM offers a dividend yield of 1.35%. Its three-year dividend-growth rate is 9.8%. So, investors can get bigger dividend returns from Brookfield Infrastructure. Brookfield Infrastructure has an investment-grade S&P credit rating of BBB+. It has about US$10.6 billion of long-term debt, and it generated about US$1.5 billion of operating cash flow in the last four quarters. At the end of Q2, its debt ratio (defined by total debt divided by total assets) was about 0.57. BAM is awarded a strong S&P credit rating of A-. It has about US$75.3 billion of long-term debt, and it generated about US$4.5 billion of operating cash flow in the last four quarters. At the end of Q2, its debt ratio was about 0.60. Brookfield Infrastructure is a stronger cash flow generator and offers a bigger cash distribution. However, BAM is more diversified. Both stocks will likely continue to deliver double-digit rates of return over the long haul. So, investors should certainly consider the stocks on dips. Seeing as Brookfield Infrastructure stock has been pretty much stagnant recently, while BAM stock had a pop, the former looks to be a better buy right now. Fool contributor Kay Ng owns shares of BROOKFIELD ASSET MANAGEMENT INC. CL.A LV and Brookfield Infrastructure Partners. The Motley Fool owns shares of BROOKFIELD ASSET MANAGEMENT INC. CL.A LV. Brookfield Infrastructure Partners is a recommendation of Stock Advisor Canada.